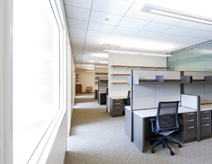 76% of regularly occupied spaces receive ample daylighting. Level 3 South – Fitout of shell space for Professors David Jeruzalmi, Rachelle Gaudet, Andres Leschziner, and Victoria D’Souza. Minor modifications to the meeting space are included for additional computer space. Level 2 North – Fitout of shell space and modifications to existing lab and office space for Stem Cell and Regenerative Biology (SCRB) Professors Doug Melton and Kevin Eggan. A compressor room in the corridor is included as part of this scope. Level 1 North – Fitout of shell space for Professors Nancy Kleckner and Guido Guidotti. Level B2 South – Renovation of existing mailroom/shipping and receiving for an x-ray crystallography suite. Level B4 South – Fitout of shell space for a 700 MHz NMR to be relocated from the Naito building.